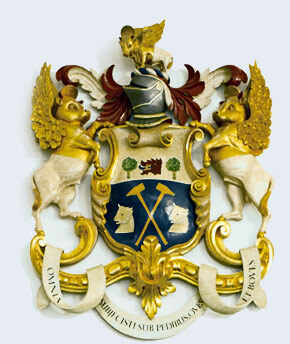 The Arms (as shown below) belong to the Worshipful Company of Butchers of the City of London and are used by the York Gild by their kind permission. 'Azure two poleaxes in saltire or blades inwards or between two bulls' heads couped in fesse argent on a chief of a third, a boars' head couped gules armed or langued azure between two block brushes vert banded or crest on a wreath or and azure, a bull with wings addorsed or the head forequarters wings, hoofs, and tuft of the tail or the hindquarters argent armed gules about the head a nimbus mantling gules double argent. On either side two supporters a Bull as in the crest'.